That tiny round black dot is Mercury. 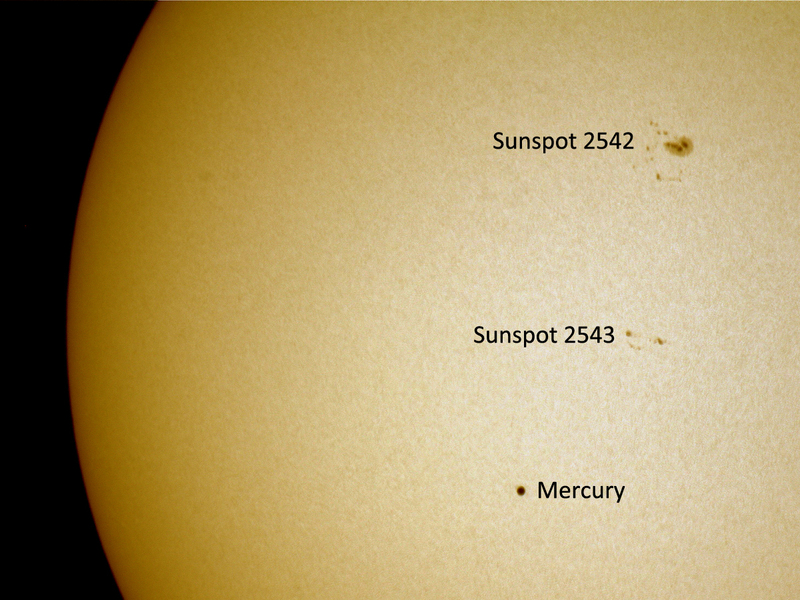 The 2016 Mercury transit of the Sun in a relatively rare astronomical event and visible in the UK for the entire time that Mercury’s silhouette will cross against the face of the Sun. Mercury transits only take place in May or November, occurring approx 13 to 14 times a century. Mercury Transit 2016. 30 x 1/1250 sec. exposures stacked together. Mercury transits in May are rarer at 13 or 33 years apart but more favourable for viewing as the planet is at aphelion (its furthest distance form the Sun and closer to Earth) with its angular size of 12 arc-seconds across and easier to view at 1/158 compared to the apparent diameter of the Sun. November transits recur 7, 13, or 33 years apart when the Sun is near perihelion (closest point to the Sun it its orbit) and only 10 arc-seconds across. Mercury is the smallest planet in the solar system (not counting dwarf planets like Pluto) and the nearest planet to the Sun and the transit occurs because Mercury passes between the Earth and the Sun every 88 days. That inky black dot in the photos looks tiny compared to the mass of the Sun. Lets not forget though that although Mercury is small, the Sun is massive and accounts for 99.86% of all mass in the solar system. Mercury is only 3032 miles in diameter, the Sun, a medium sized star, is 865,000 miles in diameter. Mercury’s distance from the sun means it bakes at an average daytime temperature of 167 degrees Celsius, the same temperature that my forehead reached while trying to image the Mercury transit that lasted for just under 7 1/2 hours. Being the space nerd that I am, I booked the afternoon off work to view it unfortunately missing the start and then being clouded out on the latter half. 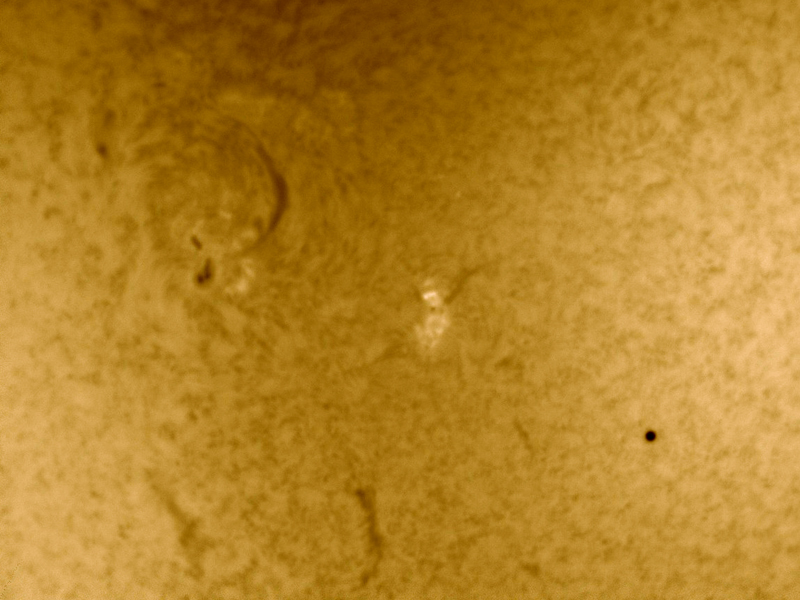 Through the entire afternoon while trying to image the Mercury transit, I’ve been battling against haze and clouds which has made imaging difficult but quite happy to get Mercury in the same frame as sunspot 2542 and sunspot 2543. These images taken from my garden in Nottingham have been acquired using specialist solar equipment. For the false colour white light images, I have used Baader Solar Film with full aperture on a Skywatcher 200p telescope and either Canon EOS 1000D DSLR or ZWO ASI120MC. The Hydrogen alpha image was taken using a Coronado PST and ZWO ASI120MC. PLEASE DO NOT LOOK AT THE SUN WITHOUT CORRECT SOLAR FILTERS. Mercury against the sun approx 2 hours before the end of the 2016 transit.